Brazil is a rapidly emerging country. Brazilian theology, namely the Theology of Liberation, has become well known in the 1970s and 1980s. The politically active Base Ecclesial Communities and the progressive posture of the Roman Catholic Church contrasted with a steadily growing number of evangelicals, mostly aligned with the military regime but attractive precisely to the poor. After democratic transition in the mid-1980s, the context changed considerably. Democracy, growing religious pluralism and mobility, a vibrant civil society, the political ascension of the Worker's Party and growing wealth, albeit within a continuously wide social gap, are some of the elements that show the need of a new approach to theology. It must be a theology that is both critical and constructive, resisting and cooperative, a theology that is able to give orientation to the churches, valuing and encouraging their contribution in society while avoiding attempts of imposition. 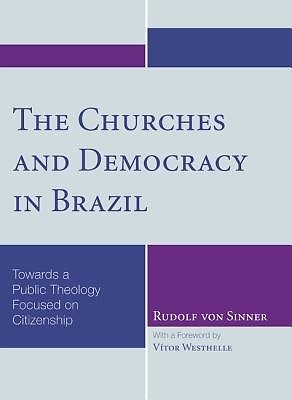 The Churches and Democracy in Brazil, the fruit of years of interdisciplinary study of the Brazilian context and its main churches and theology, makes its case for an ecumenically articulated public theology. It seeks inspiration mainly in Luther and Lutheran theology, emphasizing human dignity, freedom, trust, the disposition to serve, and the ability to endure the ambiguities of reality, as well as a fresh interpretation of the doctrine of the two regiments. These are the fundamental elements of what makes human beings full members of the body politic: citizenship, their right to have rights and to be able to effectively live them, together with their corresponding duties, in a move of growing political participation conscious of their religious motivation in view of the commonweal.